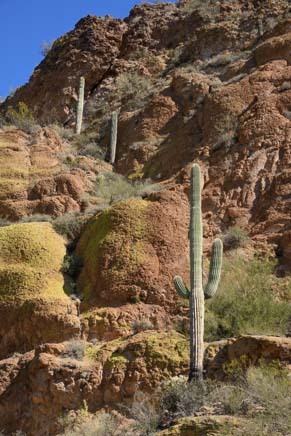 The Wind Cave Hike in Phoenix AZ - The Hills are Alive! 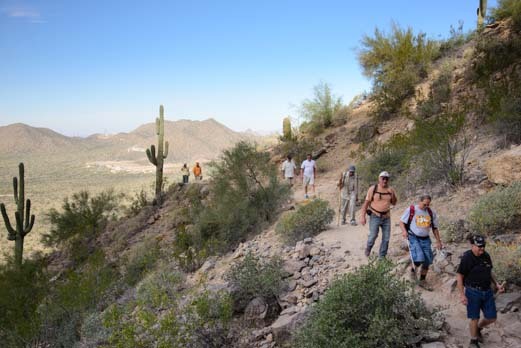 The Wind Cave Hike in Phoenix AZ – The Hills are Alive! 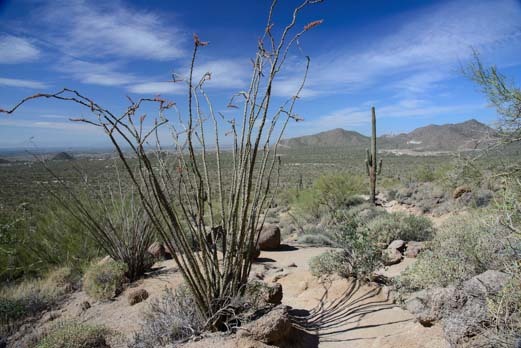 An ocotillo greets us at the start of the hike. 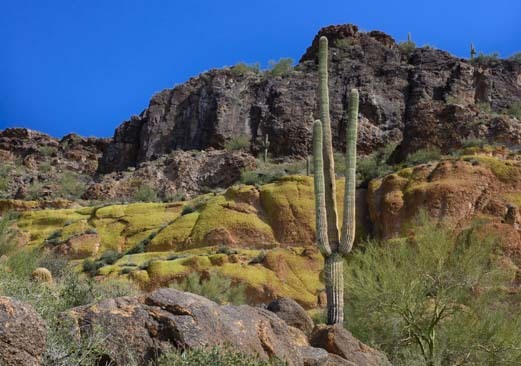 Early March, 2014 – We had been enjoying the rivers and waterways and Saguaro Lake in Phoenix, Arizona, but the cactus filled desert was never far away. 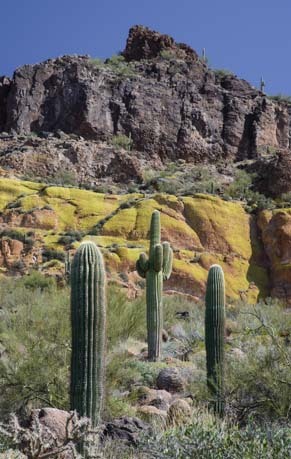 Usery Mountain Regional Park has a beautiful campground and some great hiking. 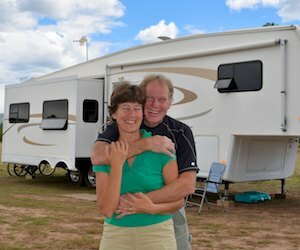 One hike in particular, the Wind Cave Trail, came highly recommended by our friends, Mike and Donna (FlyingTheKoop.com). They once called this area home and have hiked it many times. 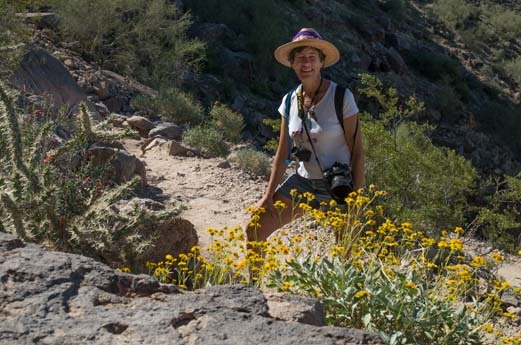 The yellow brittlebush were in bloom all around us. This is an uphill hike that climbs straight up for a mile and a half, making lots of switchbacks on the way. 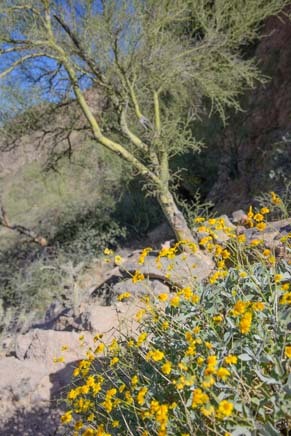 The bright yellow brittlebush flowers had just started to bloom, and there were sprays of golden flowers everywhere. There’s nothing like getting out on a warm, sunny, early spring day! 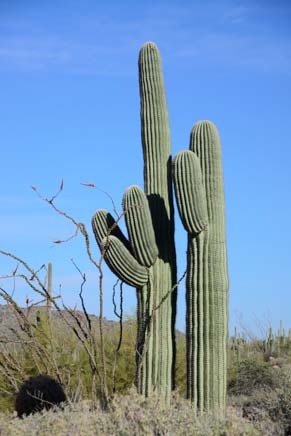 And the saguaros were standing around having their usual conversations too. One cactus looked like it was whispering in the ear of another! 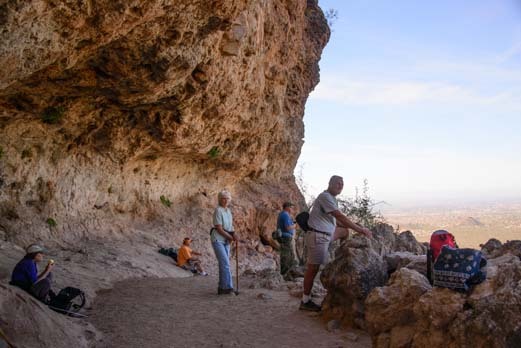 Wind Cave is a popular hike, and we met a lot of other hikers on the trail. A large group came up behind us, walking sticks and cameras in hand. It was a beautiful day to be out. We had lots of company on the trail. What sets this hike apart is the lichen that covers the sides of the cliffs in a broad band along the top of the mountain. The faces of the cliffs are shaded in the morning, though, so when we started up the switchbacks, the color on the cliff faces was muted at first. Waving “hi” to his buddy down below. 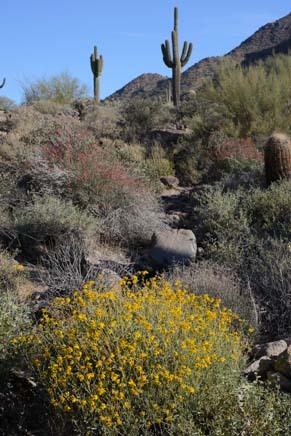 In the shadowed lighting, it seemed like a rather ordinary, though lovely, Sonoran desert hike. Then the sun began to peek around the edges of the mountain. Its warm rays lit up a solitary cactus that stood away from the cliffs. 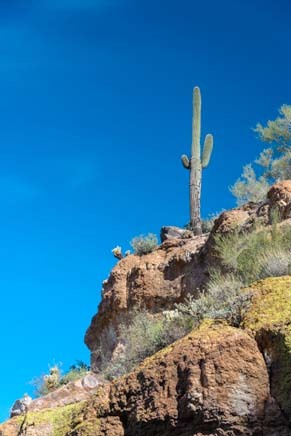 This guy seemed to be looking up at his saguaro buddy who was staning on a little higher ground above him and waving. 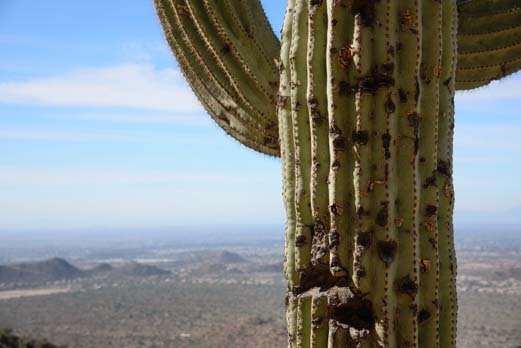 An ancient, pock-marked cactus has enjoyed this view for over a century. As we climbed higher and higher, the views across the valley begame bigger and bigger. 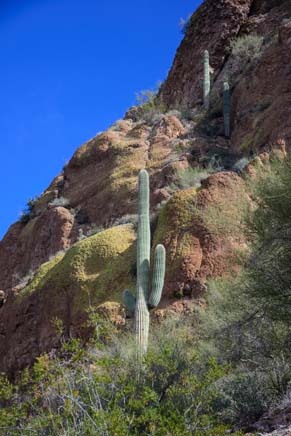 The sun and shadows played hide and seek with the cactus among the rocks. 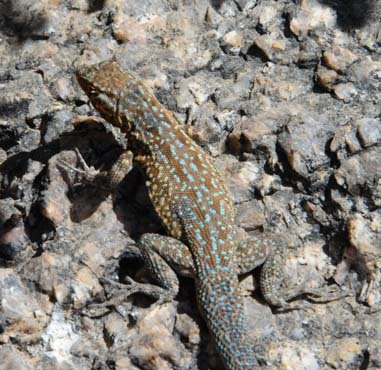 At our feet, we saw lizards scampering across the trail. We listened to the Gambel’s quails and cactus wrens calling all their friends. 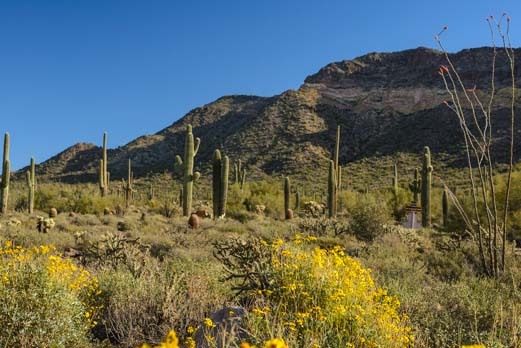 The Phoenix area is known as the “Valley of the Sun,” but as you travel around town, it doesn’t feel like a traditional v-shaped valley. Instead, it is a vast, flat, desert floor that stretches to eternity in all directions, broken up here and there by little pyramid peaks. We were hiking up a pretty tall peak, and the trail didn’t take a break anywhere — it was up, up, up. We progressed very slowly. It was just too pretty to rush, and we ended up taking photos with every step. When we finally reached the top, all the hikers who had passed us were taking a load off in the cool shade of the Wind Cave itself. It isn’t really a “cave” but is more of a sheltered spot that’s perfect for enjoying the views. 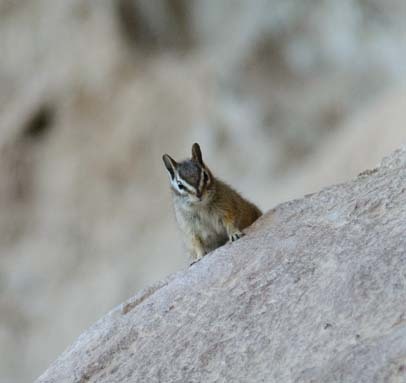 A little chipmunk peeks over a rock at us. The rocky cliff has an inward curving wall, providing welcome shade and inviting people to sit for a spell, eat a little something, and catch their breath. Lots of chipmunks live up here, and they have learned that hikers carry yummy snacks like granola bars. The chipmunks kept us entertained as we ate a snack. These little guys were very brazen, and walked right up to all of us to see if we were had something to share. Of course, who can resist a cute little furry face looking up at you hopefully? We all gave in and found a few crumbs to spare. 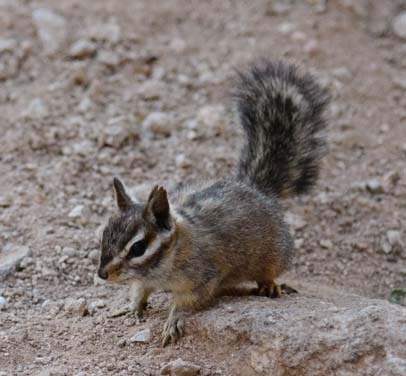 The chipmunks eagerly grabbed their snacks and ran off a few paces to nibble away, holding the treats in their little hands as they ate. By the time we started down, the sun was hitting the lichen covered cliffs beautifully. The cliffs are clad in orange and yellow lichen. 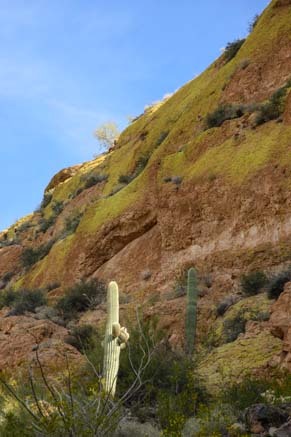 The craggy rock faces seemed to be showing off their bright yellow and orange wardrobe, and the vivid colors made a wonderful backdrop for the saguaro cactuses along the trail. We wandered down the trail to the valley floor and noticed the clouds were moving very quickly across the sky. 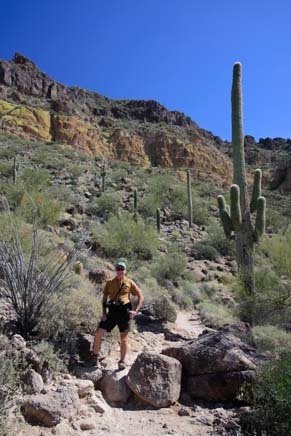 A hiker takes in the view of the valley, but the backdrop behind him is just as stunning. 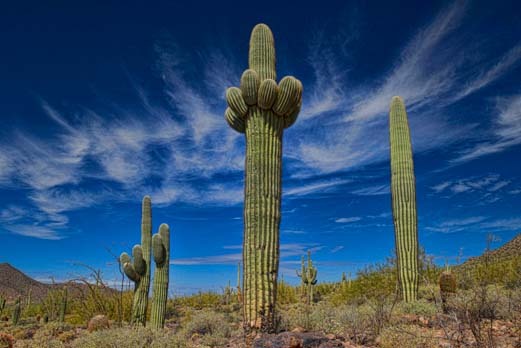 Mark took out his neutral density filter and let the moving clouds create a kind of crown around a trio of saguaros. While he was busy setting up the shot, he noticed a tiny hummingbird sitting on a wee little nest behind a thick veil of branches and leaves in a small tree. He approached the hummer and she didn’t move. She just sat tight, watching his every move. He hurried away to find me, because I had a long lens with me, and I rushed back to see if I could catch the little bird. 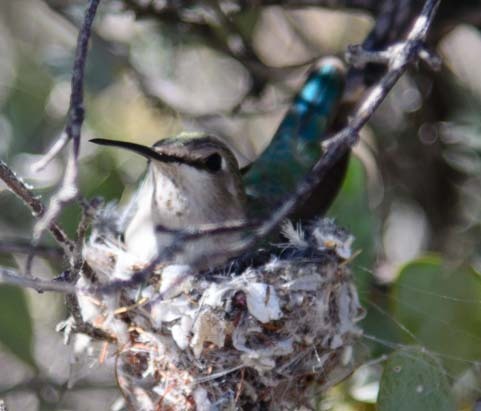 A hummingbird sits on her nest deep inside a tree. Gosh, she was buried way back deep inside those branches. I moved closer and she flew off her nest. Inside were two miniature little eggs. They were so tiny, I was afraid they would get chilled really quickly while mom was off the nest. So I stepped away, and she returned and wiggled her tail end a bit as she settled back down on her eggs. An early sign of spring! Then more hikers came down the trail and she flew off again. Her nest site was well protected, but lordy, she could have chosen a spot a little further from the trail! Oh well. I managed to fire off a few shots of her sitting on her soon-to-be family, and then left her in peace. Spring was definitely in the air. 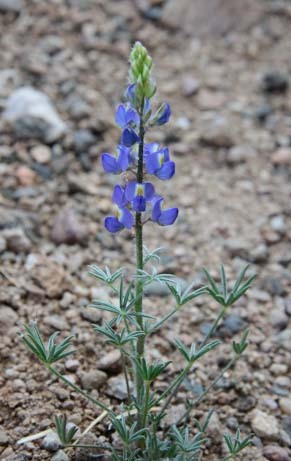 Not only were a few birds starting their families, but some wildflowers were beginning to show their colorful little faces too. 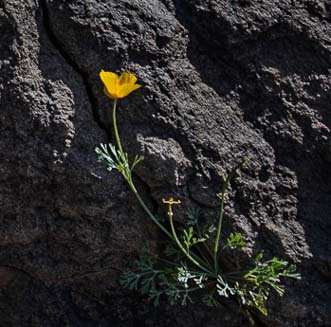 We were really excited by the early arrival of spring, and we were hopeful that soon the whole Sonoran desert would be alive with flowers. 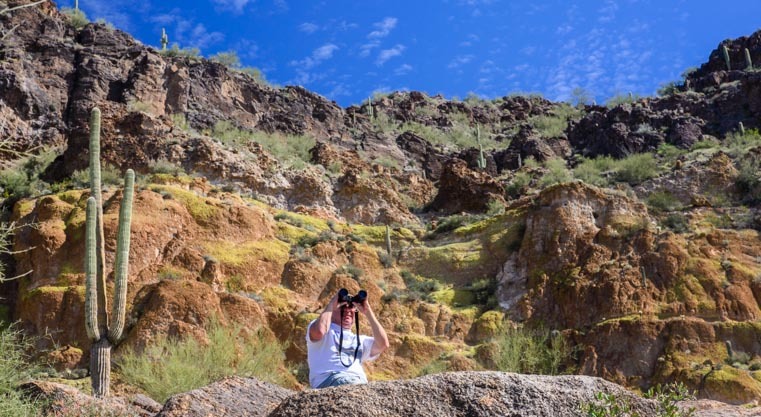 This entry was posted in Arizona and tagged Arizona, Arizona Central, Arizona Phoenix East, Hiking Biking, New, Travel, USA, WP Travel by Roads Less Traveled. Bookmark the permalink.